A mixed pack of various colours from our Merino and Silk Blends range. 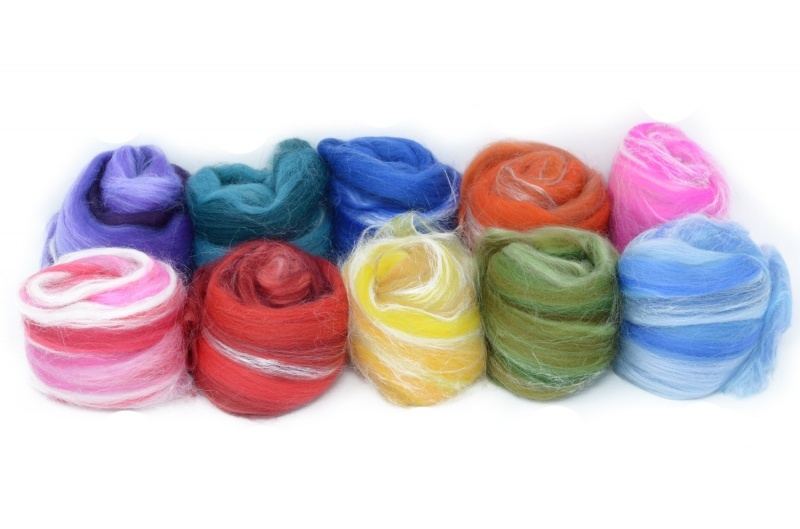 A 100gm colour bag of Merino and Silk Blends, suitable for spinning and wet / needle felting. This colour pack is made up of a random selection chosen from our ranges of Dyed Merino and Silk Blends. Designed and made entirely on-site here at Wentworth, our famous Wingham Blends have been a staple for fibre-artists around the world for over 20 years. All the shades are selected from our range of standard dyed Merinos and processed with white Tussah Silk to a 70:30 ratio (approx). Please Note: Crafts Packs are put together in batches of 15-20. As such, if you order multiples of the same pack they may contain the same fibres as the rest of that batch. The shades displayed are to give an idea of the colour range available. Your craft pack will contain 6 different shades, totalling 100gms. Q: How much of each colour will I get? A: It will vary a fair bit, but we try to work to 20cm as an average. Q: Can I choose the colours I get? A: The colours are picked and packed at random, so we can't pick a particular colour for you.